Whether you’re new to team swim or just looking for more value, I’m sharing my Swim Mom Best Buys. This is our 8th year doing summer swim team with our neighborhood. My kids have changed and grown so much! I’ve loved seeing so many kids each season then go off and graduate. Some even come back and coach the team. Over the years, I’ve asked so many swim moms questions and gotten great advice. I remember the first year my son started, there was a mom with FOUR teen boys and I was amazed at how much they ate. And already–my tweens and teen eat a ton, too! 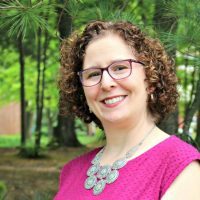 Now that I’m one of the “veteran” swim moms, I get asked often about what products are most helpful and last the longest. 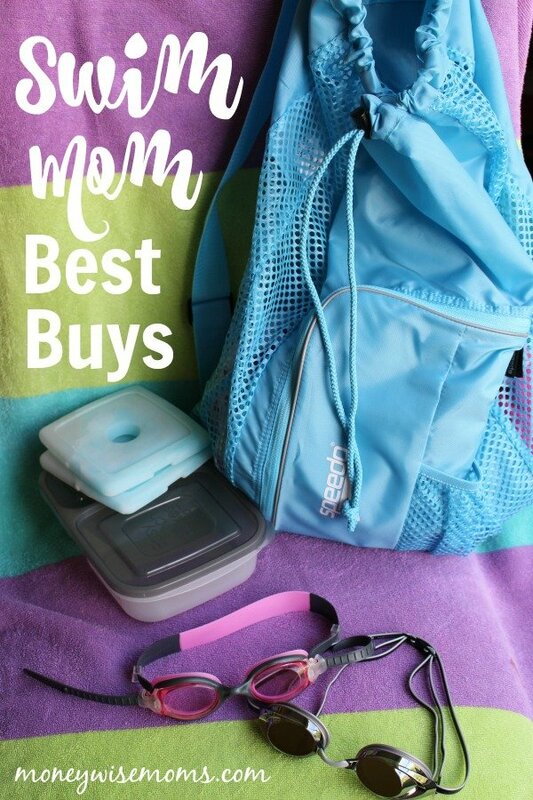 Here are my Swim Mom Best Buys. This post contains affiliate links, which means that I may receive a tiny commission should you purchase through those links. We love these Speedo Mesh Bags for toting towels, water bottles, and more back and forth to the pool. The sooner you get your kids to carry their OWN stuff, the better! This is a good-sized bag, best for kids ages 8+ and will hold a lot, plus last many years to come. Pick a bright color so it doesn’t get mixed up with their friends’. I get asked all the time about which goggles my kids use, and we’ve been through so many styles over the years. Now that they’re in adult sizes, there are two main ones we like. One of my daughters prefers the Speedo Hydrosity because it has one large, wide strap in the back. This stays on better for her. My son and other daughter like the Speedo Vanquisher, which has two straps. With my daughter’s “big hair,” she needs both straps straddling her head to keep them on. My son also likes the mirrored ones for doing backstroke at outdoor meets with the sun out. All the kids look the same once they’re in their matching team suits and caps. But for practice, the easiest way to tell my twins apart is with fun swim caps. One is a Viking, and the other a Hamburger. There are so many fun ones to choose from, so let your child pick something wacky like Spiderman or a fish. We have one evening swim meet and one early morning swim meet each week, plus even more indoor meets now that my son is doing year-round practice with another team. Rather than eat out so often, usually at pricey concessions stands with not-so-healthy food, we pack a lot of cold dinners. We use our Easy Lunchboxes and their insulated cooler bags. We’ve had these for over 5 years now, and they’ve been such a lifesaver. I’ve recommended these Fit & Fresh ice packs before because we’ve had them for years and they really do stay cold the longest out of all the ones I’ve tried over the years. Don’t forget to pack cold drinks for Mom and Dad! Are you a Swim Mom, spending a lot of time at the neighborhood pool this summer? What other needs do you have? 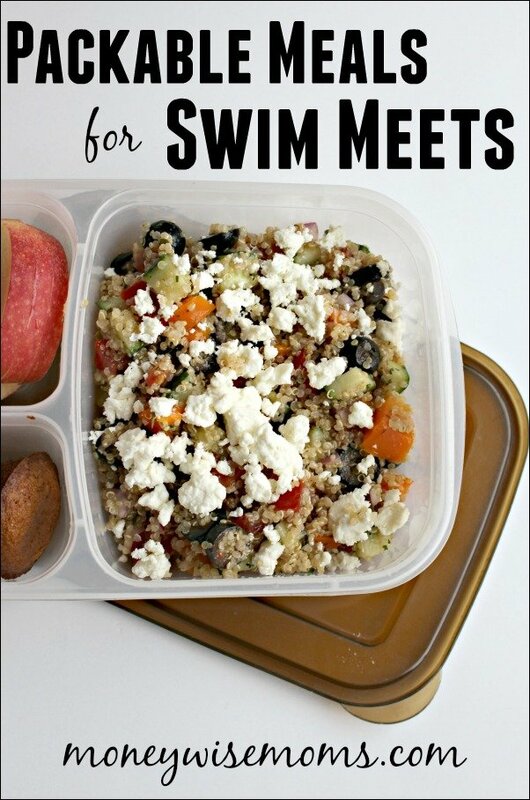 Need some healthy dinner ideas for the pool?